Designated as a Disaster-Resistant University, UNCW promotes a safe environment on campus through education, response and well-practiced plans for a variety of emergencies. There are multiple communication tools that the university may deploy during an emergency. Pay attention to the university homepage, emails, text messages, phone calls and other communications from the university. University homepage - emergency updates may be added in the News & Events sections and an emergency scrolling banner may be launched on the homepage. Seek shelter indoors. Close windows and doors. Seek information from official UNCW sources of communication. Information will be posted and disseminated as soon as possible. Wait for an "all clear" siren or message. More information is available at www.uncw.edu/siren. 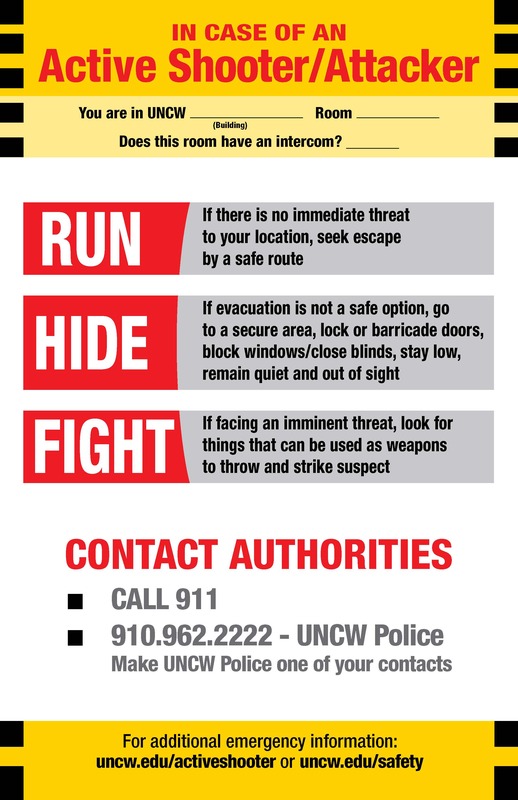 In emergencies involving relationship violence, call 910.962.CARE (2273) or 910.512.4821 and refer to https://www.uncw.edu/care.